Developed in 2014 in a city with over 3,000 years of history, the Soho Málaga Hotel is based in a refurbished early 20th century building. Soho Málaga is a new boutique style hotel and, as such, has been truly impeccably designed with the greatest care and attention to detail. The hotel aims to satisfy the needs and expectations of each and every one of its guests. The hotel's well-lit rooms are decorated in a functional and thoughtful manner. Soho Málaga offers a full buffet breakfast for an energetic start to the day. There is also a free WiFi connection throughout the hotel. 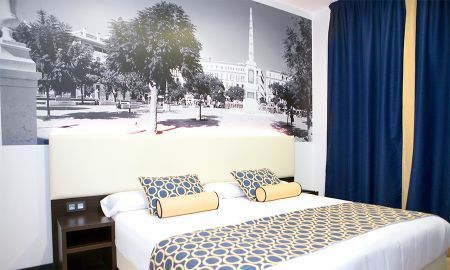 The Soho Málaga hotel is located next to the city centre, around 500 metres from Málaga Cathedral. This enables guests to enjoy the most authentic part of the city. From this area, which is currently very fashionable, all other parts of the city can be easily reached thanks to excellent public transport links. The Soho area is known as the neighbourhood of art and culture in Málaga and is surrounded by art, bars, restaurants and museums.